Located in popular Island Park on the West end of Ocean Isle Beach. Short walk to beautiful beach that stretches for miles. One minute stroll to large community pool. 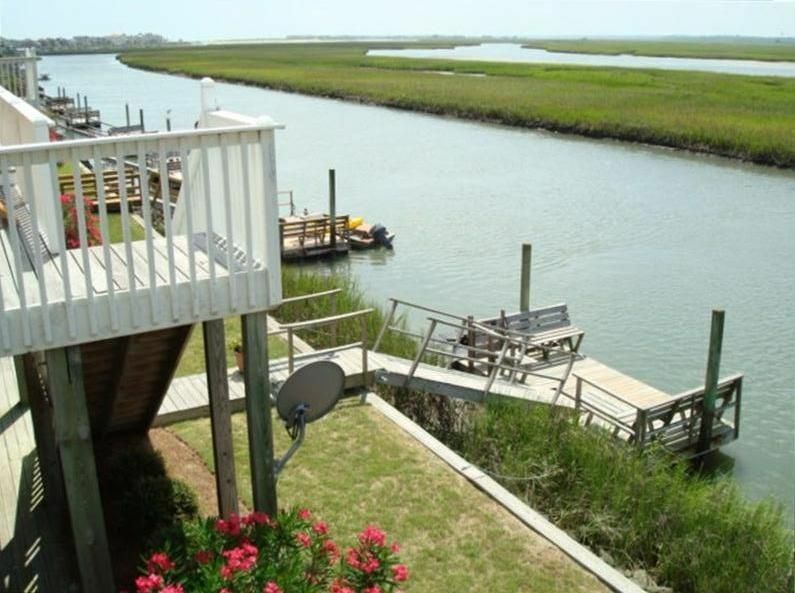 Panoramic four mile 180 degree view of sound, creeks, salt marsh, and Intracoastal Waterway from rear deck, living room, master bedroom, upstairs master bedroom and private boat dock. Free Friday night concerts on the island. There are approximately twenty golf courses within minutes. Myrtle Beach is forty-five minutes away where you can dine, shop, or enjoy the theme park. The island offers bike and kayak rentals and parasailing. There is a miniature golf course on the island. There are public tennis courts and a playground on Georgetown Road just ten minutes away. Our home has four queen beds and two twin beds. There is a hot/cold outdoor shower. Both the front and back decks are equipped with furniture suitable for dining or enjoying the beautiful ever changing scenery. Taxes and departure cleaning included. We all absolutely loved the back deck and the fishing on the dock. Overall loved the location too! My whole family truly enjoyed this home for our vacation. It had plenty of space for everyone and everyone loved the outdoor space as well. The location was great in regards to the pool and public beach access as well although I still had to drive to the restaurant due to my grandparents being unable to walk too far but overall great place! This home is updated, roomy and well decorated. Great to have a dock to kayak and fish from. Quick walk to the pool and to the beach. Quiet neighborhood. Beautiful view of the creeks and marsh from the back deck and of a community pond from the front. Great kitchen with large island. The owner was very lovely to work with. This is a great vacation home!!! House is decorated beautifully , very clean. View from the back porch is gorgeous. Eazy walk to the pool and Beach. Awesome place to stay would recommend to anybody. Thank you very much for your praise of our vacation home. We had an amazing time at Ocean Isle in this beautiful house on the canal. The kitchen provided so much space for us to hang out as a family. The rooms were clean and comfortable, but also well spread out for our little ones to nap during the day. The view is breath taking and we will definitely go back! 43 Sandpiper is an excellent beach house in the Island Park community! The house is very well maintained and very clean with lovely decorations and a very nice kitchen with ample room for cooking and groceries. There are both front and back decks, both are great places to relax, view the scenery, or read a book. The back deck overlooks the waterway and offers a great view of the evening sunset. We absolutely loved having a house on the waterway and enjoyed the personal dock for fishing and putting in our kayaks! We also enjoyed close access to the community pool and the ocean. The pool was very close and convenient. The beach access was nice as well and only a 5-6 minute walk from the house. Our family enjoyed this trip and hope to be back again! This beach house has it all a beautiful view, fishing from the dock, pool close by and a short walk to the beach. The house is beautifully decorated with plenty of room and a new modern kitchen that is well stocked. The back deck overlooking the bay is a peaceful place to start or end your day. This was our first time to Ocean Isle Beach and we will be back. Crabbing, Fishing and Swimming from private dock. There is a free concert every Friday evening on the island near the round about.